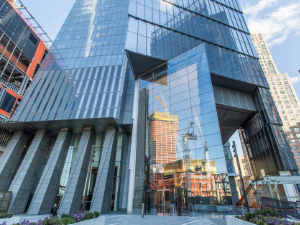 Building green is nothing new in New York City, but recently, the 52-story office tower at 10 Hudson Yards made history by becoming the first NYC building to achieve LEED Platinum Status. 10 Hudson Yards boasts 1.8 million-square-feet of commercial space including retail space on the ground floor, some high-end tenants, and now, the U.S. Green Building Council’s highest rating for sustainable buildings – Platinum Status! The building designed by Kohn Pederson Fox Associates first opened in May 2016 and is home to some big names including Coach, L’Oreal, KKR & Co., and others. The fully leased tower is also home to some sustainable-tech building features including 1.2 MW gas-fired microturbines used to generate power and regulate hot/cold water that’s supposed to be twice as efficient as conventional units used in other high-rises. 10 Hudson Yards also includes a stormwater retention tank to harvest rainwater for watering the terraced landscaping. The highlight of the luxury office tower is their Operation and Energy Control Center that helps to coordinate the building’s systems and performance. Coming off a healthy year of green development projects, 10 Hudson Yards joins some significant LEED-related firsts. In 2017, the newly renovated Perry Brooks Tower in Austin, TX, became the first LEED Platinum Status office renovation. The new home of the Atlanta Falcons (NFL football team), the Mercedes-Benz Stadium became the first professional sports stadium in North America to achieve LEED Platinum certification, and Washington D.C. became the first LEED Platinum City in the world – we’re not going to hold home team advantage against the District. Over the last few years, green building is no longer a ploy to attract business or an after-thought but a look into the future of construction. While 10 Hudson Yards is helping to continue blazing a path for the City to a greener future, we’re ready to help train the men and women who will build it.